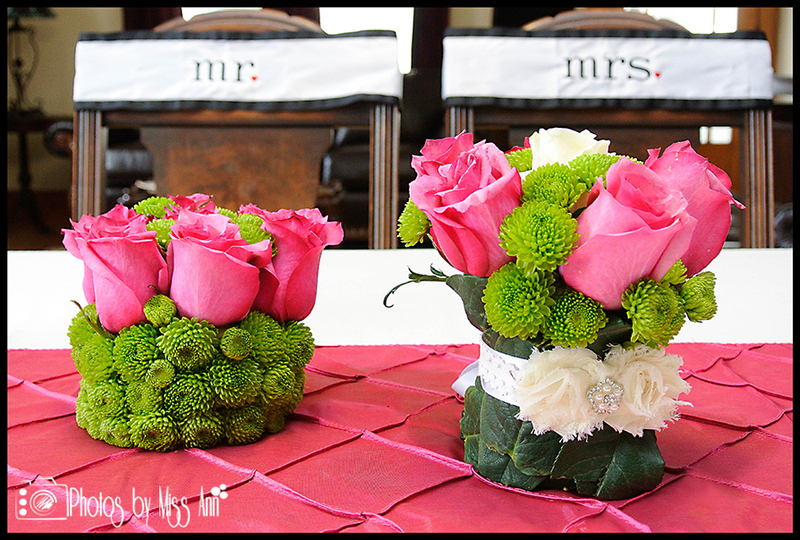 We are thinking spring over here at Photos by Miss Ann already! …which also means the influx of fabulous couples planning to have their wedding in Iceland is on the rise and we are really excited to be a part of this process! One of our wonderful Iceland brides this last week inspired us to mock up some centerpiece ideas (yes, Iceland Wedding Planner can create flower arrangements too!). 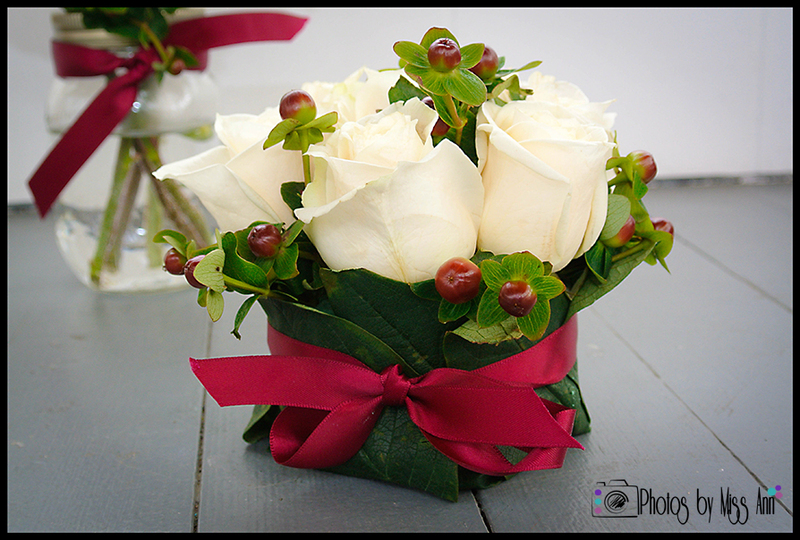 So a little sneak peak of some Iceland wedding flower photos follow below… enjoy! Hooray for you! So you have chosen Iceland as your marvelous destination wedding locale and are now trying to pick your wedding date. Your biggest question right now is when is the best time to marry in Iceland, right? Well you have come to the right place! As Iceland event planners and Iceland wedding photographers, we specialize in educating you to make the right choice for the type of wedding adventure you’d like to have. There are pros and cons to planning a wedding in every season in Iceland so today’s blog post is going to help you find out so you may make the best choice as you Iceland wedding plan! So let’s explore month by month and season and by season! January: Our Iceland Wedding Planner team does not plan or photograph weddings or elopements during this month. For us, there is not enough daylight hours and the weather is too brutal. It’s very likely the main road closes as well so ensuring our staff can travel to/from your fabulous day can be too challenging. Our Your Adventure Wedding team is based in South America during this month planning and photographing adventure weddings and elopements in Patagonia. Holding your wedding in January in Iceland you will find the hours of daylight fluctuate. The beginning of the month you have about 4 hours and 20 minutes of daylight and by the end of the month you have up to 5 hours of daylight. The average sunrise time in Iceland: 11am and sunset time in Iceland in January is 4:20pm. Average temperatures are 35ºF / 27ºF. Best Iceland wedding locations during this time indoors would be a country church or a Iceland cave wedding. Make sure you can handle the possibility of walking down the aisle in snow, crazy winds, and extreme rains as this is the reality of a wedding in January in Iceland. Special Note: The coastline of Vik Beach (Reynisfjara) can be dangerous during this time (10 foot waves or higher crash into the cave). January also has the second highest rainfall at an average of 3.40 inches. But the fun part is that you could easily experience all 4 seasons in one day plus the Aurora Borealis, pro or con, you decide! February: Oh la la February in Iceland! It can be hit or miss with snow, but likely (and hopefully) SNOW! 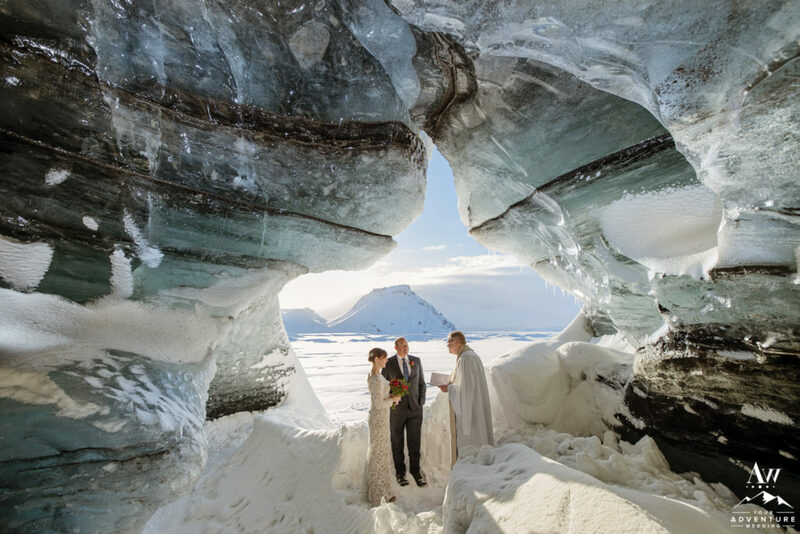 This is also prime time to have an Ice Cave Elopement in Iceland! February weddings in Iceland offer average temperatures of 37ºF / 29ºF and anywhere between 7-10 hours of daylight. The average sunrise time in Iceland in February: 9:20am and sunset time in Iceland: 6pm in February. Rainfall during this time averages to 2.90 inches (so it can be hit or miss with rain versus snow conditions). During this time some possible Iceland ceremony locations could be one of the wonderful host hotels we work with or one of the gorgeous country churches if needed indoor options. If you can brave the gorgeous outdoors and colder temps then one of our private ice caves, waterfalls, canyons, or natural caves could shield you nicely from the elements! February is also a time in Iceland where the Northern Lights could be in full display. March: March is still considered winter in Iceland but this is typically the time where Southern Iceland is lessening the snow fall and having more rain each day. The Average sunrise in March is 7:46am and sunset is 7:39pm. Iceland in March offers up 37ºF high and 29ºF as a low with rainfall being an average of 3 inches. Having your wedding at the majestic Seljalandsfoss Waterfall, Skogafoss Waterfall, Blue Lagoon, or Jökulsárlón Glacial Lagoon is totally doable during this time. But if you’d rather hold your Iceland destination wedding inside at a Icelandic church or one of our stunning host hotels would all be perfect options. Even if you choose an indoor location hopefully the Iceland wedding photographer you choose will still photograph your Iceland wedding portraits at those amazing outdoor locations (I know Photos by Miss Ann would as we have no silly rules on consecutive time limits for your wedding day)! April: Welcome to Spring in Iceland! The sun shines more and there is still a chance to see the splendid Northern Lights. The average sunrise and sunset in Iceland in April is 5:56am / 9:02pm with fabulous temperatures of 41ºF high and 33ºF as a low with rainfall being an average of 2.20 inches. 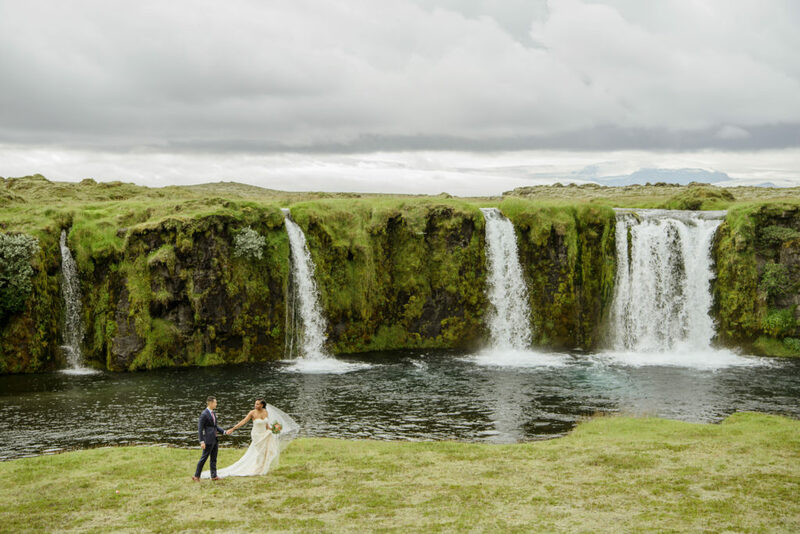 All of the gorgeous waterfalls, lagoons, mud pots, canyons, cliffs, and sod farms in Southern Iceland are all viable options to hold your wedding ceremony. My husband and I held our Iceland wedding ceremony at Seljalandsfoss waterfall, led our guests to Vik Beach for a wedding champagne toast, a pit stop to the awesome Vik Beach, Icelandic Wool Factory, Skogafoss Waterfall, and back to our host hotel for a 5-course Icelandic wedding reception dinner. We personally felt April offered us the most adventure in daylight time, least amount of tourists, a possibility to see the Northern Lights, and endless activities from ice climbing, caving, to scuba diving. May: May is a really exciting time in Iceland especially for brides and grooms! All of the roads to the West Fjords and the Northern Highlands are accessible. So you can easily drive the entire country without a 4-wheel drive vehicle. Which means all of the gorgeous spots like Lake Mvatyn, Dimmuborgir, Godafoss Waterfall, Skaftafell National Park, and the Thingvellir National Park are available for you to say “I do” at! The average daylight hours in May in Iceland is sunrise at 4:13am and sunset: 10:38pm. You will most likely encounter temperatures like a 47ºF high and 39ºF as a low with rainfall being an average of 1.70 inches. June: June begins the high tourist season in Iceland and the most amount of daylight. Average sunrise is 2:57am and sunset 12am in June in Iceland. You’ll feel temperatures like 52ºF for the high and 44ºF as a low with rainfall being an average of 1.80 inches in June. The really awesome thing about so many hours of daylight is that you can still do things! Unlike the United States State Parks, Iceland does not close or gate entrances to their marvelous natural wonders. So if you wanted to hold your wedding at 8pm at Seljalandsfoss waterfall you can- no questions asked! No gates, no fees, and no security personnel rushing you off the property. Too good to be true? No, Iceland trusts you. They trust you will not only have a high respect for the people and area but that you will not endanger yourself either. July: Welcome to Iceland’s Busiest Month. Daylight time also begins to decrease now, as the average sunrise is 3:41am and sunset: 11:24pm. The temperatures are the highest they are all year with a dazzling 55ºF high and 47ºF as a low, with monthly rainfall being an average of 2 inches. So whether or not you are drawn to having an indoor Iceland wedding location or you are an adventurous bride and groom and choose an outdoor Iceland ceremony location, it’s your call as all are available to you. But do keep in mind this is still considered the high tourist season in Iceland so if you intend to plan a wedding during this month, plan early. Hotels book up 10 months before and the gorgeous natural spots will have people flocking to them so do not expect a 100% intimate area if planning by yourself. As Iceland Wedding Planners, we are experts in Iceland destination weddings from finding that gorgeous intimate wedding spot to finalizing all of your wedding day logistics. August: ::Personal Favorite Month:: August is hands down our best weather month, the greenest, and most accessible! August is still considered higher tourist season in Iceland. August weddings in Iceland offer an average sunrise of 5:19am and sunset at 9:45pm. Summer temperatures continue at a balmy 54ºF high and 46ºF as a low with the rainfall being an average of 2.40 inches. During this month there are also some very high profile events going on in Reykjavik such as the Iceland Gay Pride festival, Music Festivals, Reykjavik Annual Marathon, and dance festivals. Booking your Iceland wedding host hotel early is key (think 15-18 months before). 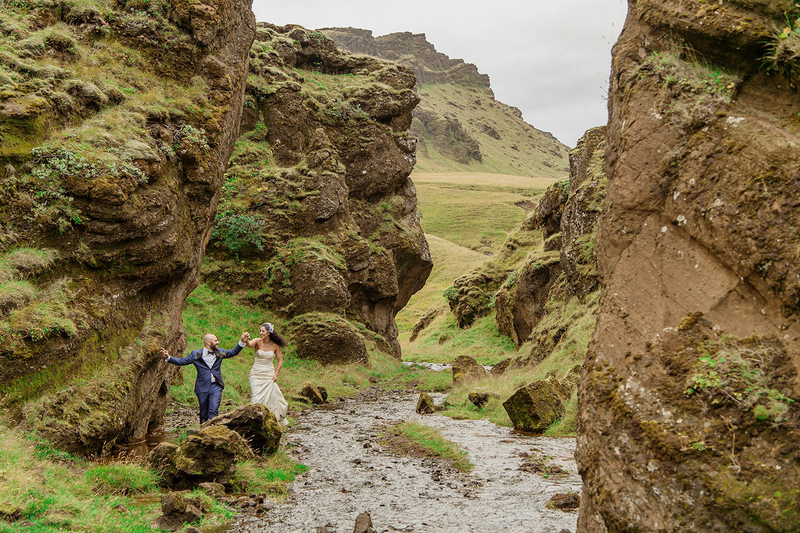 All of Iceland’s gorgeous areas are open from waterfalls, lagoons, and canyons they would all be a perfect choice for your Iceland wedding location. September: September marks the start of Iceland’s “shoulder season.” Average sunrise in Iceland in September is 6:51am and sunset 7:53pm. You’ll experience temperatures like a 49ºF high and 41ºF as a low with rainfall being an average of 3.50 inches. So if you are getting married in September in Iceland you may want to offer umbrellas (like we did in our welcome bags) to your guests if planning an outdoor wedding at one of Iceland’s waterfalls or other remarkable natural wonders. As you plan, keep in mind Iceland’s “big round up” happens in early September where the sheep are herded annually, plan and book early! This is also the time the following events happen in Iceland: Annual Literally Festival, Jazz Festival (could be August too depending on the year), and the Reykjavik International Film Festival. If you can bundle up and brave the gorgeous outdoor colder temps then Seljalandsfoss waterfall, Skogafoss Waterfall, Hotel Budir or Hotel Laekur’s gorgeous grounds, or the Iceland Glacial Lagoon would be great choices during this time as well. October: October in Iceland is not exactly like fall in the States if that is what you are looking for… there are not many trees but there is color changes in flowers, mountain bushes, grass color from green to yellow, etc. The daylight hours significantly begin to become closer to winter hours now with an average sunrise time in 8:15am and sunset: 6:10pm. The temperatures really drop this month with an average 36ºF for the high and 28ºF as a low with rainfall being an average of 3.30 inches. In many areas it begins to snow especially the Iceland Highlands and the roads become inaccessible again (and 4 wheel drive needed). During this time some possible Iceland ceremony locations would be a country church in Iceland or one of the fabulous host hotels we partner with. If you can brave the gorgeous outdoors and colder temps then Seljalandsfoss waterfall, Skogafoss Waterfall, Vik Beach, Blue Lagoon, southern Iceland canyon, rivers, or the Iceland Glacial Lagoon would be great choices during this time as well. November: November weddings in Iceland are officially considered being in winter. 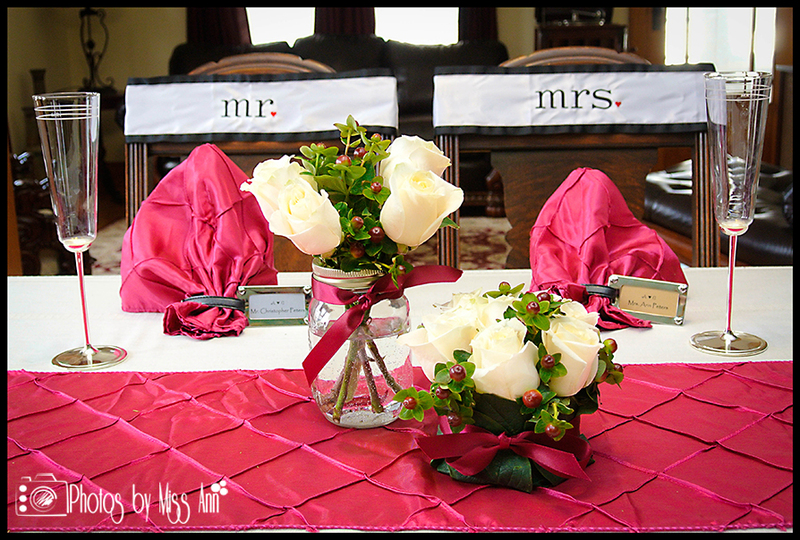 Some possible Iceland ceremony locations would be one of the hotels in the area that we partner with can accommodate larger groups for your indoor ceremony options or one of Iceland’s many country churches. If you’re feeling adventurous and can brave the gorgeous outdoors and colder temps then Seljalandsfoss Waterfall, Skogafoss Waterfall, one of Iceland’s many glaciers, canyons, rivers or the Iceland Glacial Lagoon would be great choices during this time as well. You’re looking at an average sunrise time being 10am and sunset in Iceland in September of 4:30pm. The temperatures are colder so make sure you dress and pack for the conditions of a 34ºF high and 31ºF as a low with rainfall being an average of 3.30 inches. December: The holidays in Iceland are simply inspirational. Although December offers the least amount of daylight, it does offer up the most amount of heart. The people in Iceland love the holidays and invite tourists to be a part of their awesome festivities. Exciting events like the following: the lighting of the Oslo Christmas tree happens every year on December 2nd in downtown Reykjavik, Icelandic Yule Lads running around, and a spectacular fireworks display in downtown Reykjavik on New Year’s Eve! The average sunrise is 11:15am and sunset is 3:30pm. While you are enjoying all of the holiday lights and events you will have temperatures like a 36ºF high and 28ºF as a low with rainfall being an average of 3.30 inches. So bring an umbrella and watch for the Northern Lights! Winter: The pros of a winter wedding in Iceland are the Northern Lights! November-March are typically the most active months for the Aurora Borealis because of the colder clearer temperatures in the high and lowlands of Iceland. The temperatures are lower but so is the tourist flow which translates into your first choice of wedding locations and stunning Iceland wedding portraits! Spring: Iceland Spring weddings are between April-May (considered Iceland’s shoulder season). This time frame offers up warmer temperatures (a balmy 45ºF!) and typically the least amount of rainfall for the year. In April you do still have a chance of seeing the Northern Lights too! My husband and I were married at Seljalandsfoss Waterfall on April 14th 2012 and the Icelandic News called us brave because we had periods of rain, mist, sun, sleet, 45ºF, and somehow ended the day with gorgeously chilly, but clear star gazing night! Although we did not have the Northern Lights appear on our wedding night, days before we were graced by them in the countryside at Hotel Ranga. Spring was also a perfect time for everyone to travel since the snow was melting in the States and the heat is too much in the Southern Hemisphere. We were traveling from Plymouth, Michigan and our 35+ guests from around the world. We had guests come from all over the United States and as far as Australia, South Korea, and Europe, all for our adventurous destination wedding in Iceland! Summer: June-August are the peak tourist season months in Iceland and offer the highest temperatures all year at 55ºF and a low of 47ºF. The Iceland highlands and interior are also fully accessible during this time and do not require 4 wheel drive. Many of the arts and cultural festivals are also in full swing. This is a beautiful time to hold a wedding in Iceland’s West Fjords or Lake Mývatn-Krafla Caldera areas. But please keep in mind an Iceland Summer wedding can be tricky to plan because of the high volume of visitors. If interested in this time frame make sure you plan early (at least 10-12 months before to avoid disappointment) to ensure your first pick on wedding location and host hotel for your guests. Although if planning on your own, I would not suggest planning a wedding anywhere on the ring road because although there is “enough room for everyone” you may not get the gorgeously intimate experience as you hope. 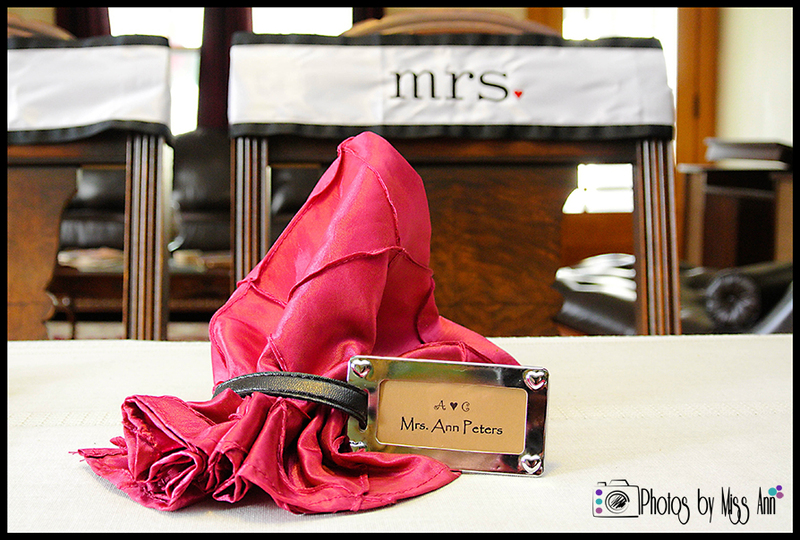 As experts in Iceland wedding planning and Iceland wedding photography, Photos by Miss Ann can help you plan your Iceland destination wedding to the level of intimacy you are looking for. 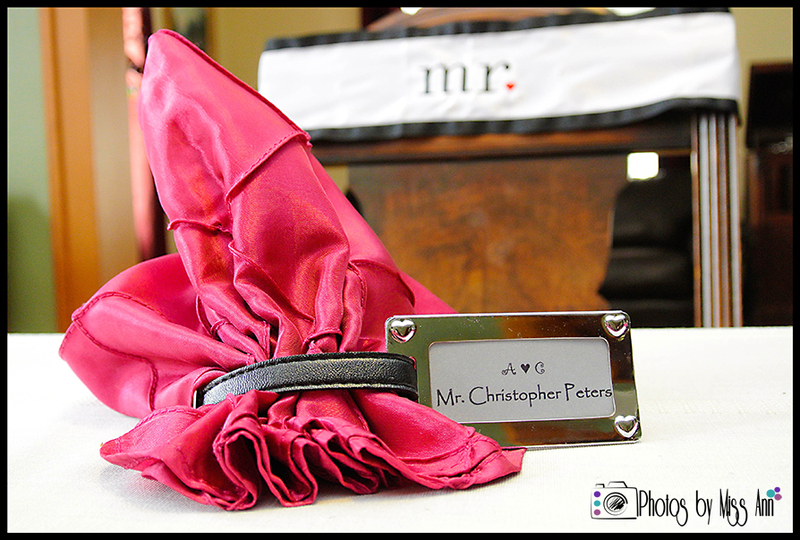 We have the contacts, the insight into the right spots and positioning to create that ambiance. Fall: Iceland Fall weddings are between September-October (also considered Iceland’s shoulder season). The temperatures begin to drop and the roads begin to become impassable again and 4 wheel drive is needed. Iceland ceremony locations would be one of Iceland’s farm or country churches or one of the exceptional host hotels we partner with as indoor options (please contact us for further Iceland wedding planning details!). Or be daring and brave the outdoors and colder temperatures for the lovely natural wonder locations such as Seljalandsfoss waterfall wedding, Skogafoss Waterfall, Vik Beach, beside one of Iceland’s amazing rivers, canyons, glaciers, the unique Blue Lagoon, or the Iceland Glacial Lagoon for your Iceland wedding ceremony location. We hope you find this post helpful to you as you embark on your Iceland destination wedding planning experience! We are a creative, energetic, experienced husband and wife team based in the United States but specialize in Iceland wedding planning and destination wedding photography. We have 10 years of destination wedding photography and planning experience in all countries and environments from big cathedrals to shorelines. In April 2012 we personally planned our own wedding in Iceland at the majestic Seljalandsfoss Waterfall and have photographed throughout the country. We know firsthand how epic of a country Iceland is and how special it is for you to plan your wedding in Iceland! We believe that in order to fully create and capture your wedding day vision, personalities, style, and your destination wedding properly, we need time with you! For us, getting to know you as a couple and getting to know your wedding destination is an important base for creating truly unique Iceland events and stunning images for you and your loved ones. Please contact us to plan or photograph your Iceland Destination Wedding! Thank you so much for this blog! My (fingers crossed) soon-to-be fiance have been hunting around for people we can trust to help us plan an Iceland wedding in the future and you guys really seem to have great ideas!